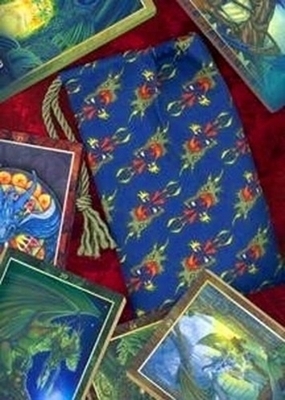 Enraged dragons spew flames diagonally across the surface of this indigo blue tarot bag. With dozens of these fire-breathing green dragon heads protecting the deck within, who would dare touch it? 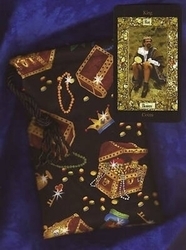 Use dragon-power to stand watch over your cards or other goodies. Guard your dragon's hoard of personal treasures! 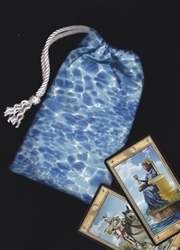 This bag is also perfect for holding runes, herbs, jewelry, decks for trading card games, collectible card sets, role playing game (RPG) die ... limitless possibilities. 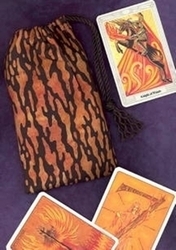 Suggested Oracle & Tarot Decks: Any tarot card deck that feature dragons would match beautifully with this bag, as well as some Celtic, Asian, or animal themed decks. Dragon Symbolism: Nearly every culture in the world has tales of dragons. 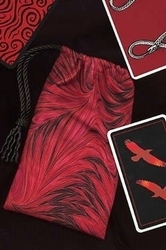 Symbolically, the dragon carries many, often contradictory, meanings. Dragons are depicted as great and fiery serpents or as dark and greedy wyrms; as beneficent creatures, or as evil snakes. The cultural constant? Invariably, dragons are associated with some kind of elemental energy. In European lore dragons are winged, fire-breathing beasts living in lairs or rivers. They guard great hoards of gold and treasure. Most Asian cultures see dragons as symbols of wisdom, longevity, and fertility, and are associated with water. In the Americas dragons are typically snakelike and associated with water. Perhaps the most well-known dragon from Mesoamerica is the Mayan people's Feathered Serpent, Quetzalcoatl, who controls the weather and brings rain.